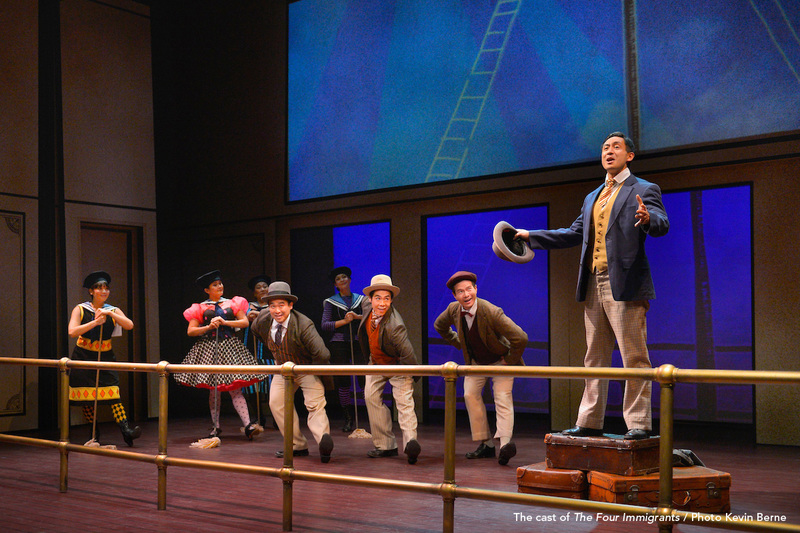 “We are the four immigrants” thus begins entirely engaging and ravishingly gorgeous musical, at Theatreworks Silicon Valley premiere, at Palo Alto’s Lucie Stern Theatre. Playwright and composer, Min Kahng adapted the theatrical production from a comic book by Henry Kiyama and tells the story of new immigrants from Japan from 52 comic strips, beginning in 1904. Unlike the European immigrants who landed on the East coast, often fleeing religious persecution, the immigrants from Asia came for new opportunities and to realize the American dream “I’ll break the mold and make my mark”. While the immigrants from Europe encountered discrimination along the lines of poverty, new immigrants from Asia also had to deal with racial prejudice. This musical tells a universal tale of people leaving their homeland for any number of reasons and then search to find a life and make a home in the new land. 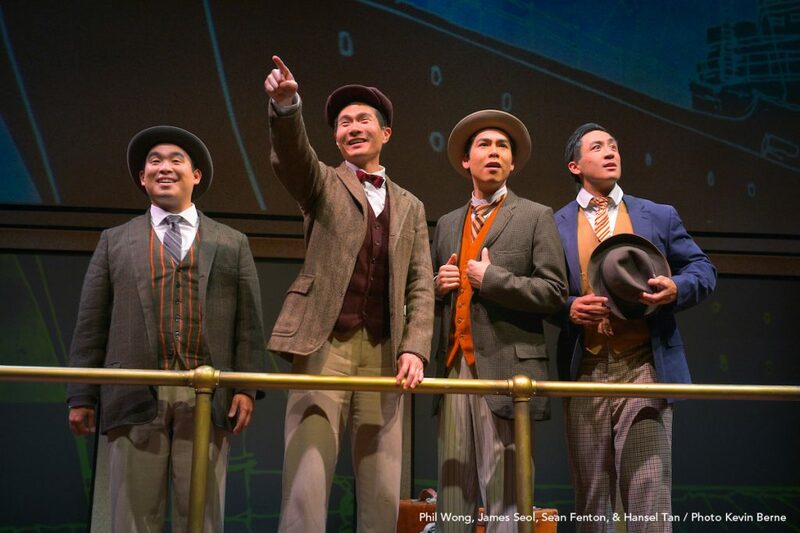 The musical speaks of such adventures of four men, Charlie (Hansel Tan), Fred (Sean Fenton), Frank (Phil Wong), and Henry (James Seol). These are four incredibly talented actors who deliver a stunning performance of riveting dances and engaging lyrics as they talk about their experiences; weaving in significant historical events like devastating San Francisco earthquake, US Government call to join the military in world war II, racial bias and Government denial to grant citizenship, even to war veterans. These men also have obligations back home and from time to time experience the guilt and shame of not rising up to expectations; for instance, when they fail to send money home in a timely manner. Search for a life partner often raises questions about areas where immigrants are tied to known customs and traditions and where these collude in their simultaneous quest to embrace the modern ways of new homeland. Gradually, these young men in Henry Kiyama’s comic strip mature and make a life in their new homeland. They each in their own way, embraces and blends the old and the new. Whilst they began with sweeping floors and making sacrifices, they learn that not only they can enjoy the fruits of their hard work but their new homeland requires them to be engaged members in the community; standing up for and demanding their rights. They sing with satisfaction, “I know I have something remarkable to share with the world”. We also learn that motherland is never forgotten, as we hear them sing with longing, “Kurusato”. Great kudos to Leslie Martinson for brilliant directing and casting. Four male actors are joined by Rinabeth Apostol, Kerry K Carnahan, Catherine Gloria and Lindsay Hirata who play a variety of male and female roles with aplomb. Also great kudos for superb use of props and stage to Marcy Victoria Reed and Christina Larson. As the founding director of Theatreworks, Robert Kelley has announced his retirement after 50 years of dedicated stewardship, we must acknowledge the incredibly bold and perception changing performances that have been brought to stage under his helm. Such an incredibly warm influence to counter the current cold reality of increasingly anti-global, anti-immigrant, anti-environment, anti-diversity vibes coming from Washington D.C. True to Theatreworks’ core values, these phenomenal productions are not only fabulously entertaining, they also gently guide us to learn and be better informed, to embrace diversity and to shift our point of view to one that is more global and more inclusive. For this theater season, I am selecting, “The Four Immigrants” running at www.theatreworks.org till August 6, 2017 a must-watch-play of this theater season. In true spirit of Silicon Valley where the production took shape, it is extremely innovative, highly entertaining, solidly engaging and brilliantly done.